The Bourne Legacy occupies a fairly unique place in the history of movie franchises. It’s not a direct sequel to the trilogy of Matt Damon Bourne movies, because the character Jason Bourne isn’t in it. It’s not a continuation of that series, either. (And it’s definitely not an adaptation of the Eric van Lustbader’s novel of the same name, which continued the story of the amnesiac spy beyond author Robert Ludlum’s trilogy.) Rather than moving forward in time and building on events of The Bourne Ultimatum (review here), it takes place concurrently with those events. That’s potentially a very cool idea. Unfortunately, however, it doesn’t really take full advantage of that conceit. The trailers made it look like it cleverly interconnected with the events of Ultimatum, but it doesn’t. Bourne surrogate Aaron Cross’s mission has nothing to do with Jason Bourne’s. The connection is pretty tenuous, in fact. We’re asked to believe that Bourne’s exposure of the top secret Treadstone program (in which the CIA trained super-assassins) and the subsequent Senate hearings leads shadowy intelligence honcho Ed Norton (playing "Retired Col. Eric Byer, USAF," who I’m not sure is ever addressed by name on screen) to completely dismantle the similar Outcome program. Outcome does Treadstone one better because its agents aren’t just trained to be the best assassins they can be; they’re enhanced to be so via a steady regimen of pills that make them smarter, faster, better. The green pills increase their strength, and the blue pills enhance their minds. Thus getting ahold of new pills becomes Cross’s sole objective, the engine that drives him—and the film—for the ensuing two plus hours. While you might be asking yourself how badly he really needs super strength and super intelligence when he already seems to be in pretty amazing shape, that’s addressed in a reveal about halfway through the movie: Cross’s intelligence isn’t being increased to super-genius levels; it’s being raised to normal levels. He was previously a soldier with a very low IQ (his recruiter had to add points to reach the Army's "minimum standard") who volunteered for the Outcome program and earned himself a serious boost. Writer-director Tony Gilroy takes a page out of Flowers for Algernon (or, as I immediately thought of it, the various Simpsons take-offs on that premise in which Homer’s intelligence is increased by removing a crayon from his brain or Lisa thinks hers will be reduced when the Simpson Gene kicks in at her next birthday). Aaron Cross must find some chems, or else his mind will regress to sub-normal levels. Cross’s quest first takes him to the secluded home of Dr. Marta Shearing, and not a second too soon, either. A hit squad deployed by Norton has just turned up at her abode, which leads to the film’s most impressive shoot-out during which Renner demonstrates that he’s got all the action chops of Matt Damon. The two Outcome refugees go on the run together, heading for Manila where the drugs are manufactured. We’re treated to some cool and very Ludlumy spycraft as Cross forges them fake passports and plots their egress from the country. Then we cut to the operations room where Norton’s got people searching every passenger manifest and airport security tape looking for the fugitives. 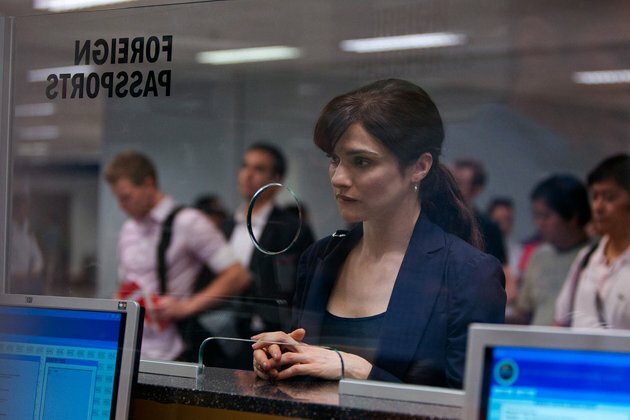 It’s in these effective scenes that The Bourne Legacy feels most akin to its predecessors; audiences are used to teams of analysts staring at computer screens hunting for AWOL agents. In Manila comes the film’s next major action setpiece. It’s kind of odd in a Bourne film (or a film with the name Bourne in the title, anyway) that there are really only two major action setpieces involving the hero (this and the shootout at the house), but Gilroy attempts to auto-correct for that by making this one a plus-size extravaganza. 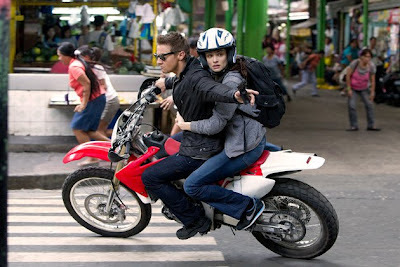 The final chase through the streets of Manila finds Cross first on foot—running across the rooftops, engaging in the Filipino martial art Kali, and pulling off the film’s signature stunt (which you’ve no doubt seen in the trailers) wherein he leaps from a rooftop into an ally, landing on a policeman and taking him out—and then on a motorcycle. Once Cross and Marta are on the motorcycle, comparisons to James Bond in Tomorrow Never Dies become inevitable. No, Bond wasn’t the first spy to ride a motorcycle (Coplan, Cotton and Helm all beat him to it back in the Sixties), but Tomorrow Never Dies really managed to define the motorcycle chase with a man and a woman on the same bike at once. When that concept popped up in Knight & Day (review here) with Tom Cruise and Cameron Diaz, it was impossible not to recall the 007 film, and the same is true here—particularly given the somewhat similar setting. (Bond was in Saigon.) The Bond comparisons don’t end with Marta’s presence on the motorcycle, however. While Bourne chases have, in previous films, felt firmly grounded in reality, this one takes on the more over-the-top, credibility-straining tenor of a Bond chase as soon as Cross plants his motorcycle atop a railing to get around the throngs of people ascending and descending some public stairs. He then slides down, with the wheels straddling the rail. It’s a very Bondian maneuver. I mention this by way of observation rather than criticism. Obviously I enjoy a good Bond-style chase scene; I just think it’s worth noting this slight shift in tone for the Bourne series. Overall, the Manila-set mega-chase is pretty impressive. For starters, the scenery is exotic, which I always want out of a spy movie. While there were some good spy chases in that city back in the Seventies when the Philippines had no safety laws governing film shoots (Wonder Women springs readily to mind), we haven’t seen a Western spy movie set there in quite some time. This is the kind of setting I want in a Bourne movie, in keeping with the clogged European streets of the first two films, or the bustling Tangier rooftops of the third. Furthermore, where Gilroy really breaks new ground in this chase is with the crowds. Sure, there were crowds in the Tomorrow Never Dies chase, but not this level of crowds! The streets Cross navigates are positively teeming with people, presenting near-constant obstacles for someone trying to make a quick escape. Every citizen of Manila must have been employed as an extra! On the downside, the lengthy chase does overstay its welcome a bit as Cross and Marta are relentlessly pursued by an unstoppable Filipino Terminator. Actually, the pursuer is a sleeper agent from yet another Treadstone-inspired super soldier program even better than Outcome, Larx, which is described as “Treadstone without the inconsistencies” because it strips its agents of all emotion. But with his ever-present sunglasses, motorcycle and seeming invincibility, you fully expect to hear the strains of Brad Fiedel’s Terminator theme every time he’s shown! The chase also suffers, to some degree, from the overly-rapid editing that’s plagued any number of action movies in the post-Greengrass era. 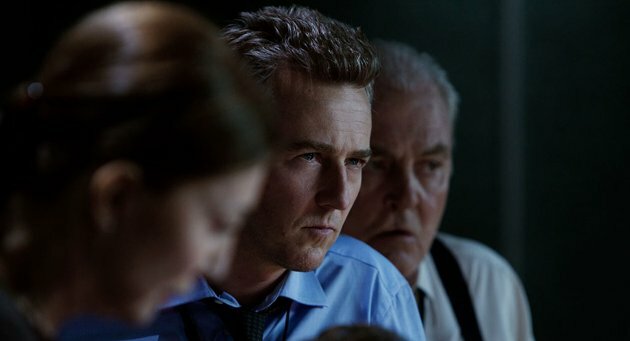 Greengrass himself required one film to practice this style (the flawed Bourne Supremacy) before honing it in Ultimatum and perfecting it in Green Zone (review here). Nearly every imitator (and there have been lots) has failed to replicate his urgent, immediate action scenes. Gilroy pulls it off with much greater success than Marc Forster did in Quantum of Solace (review here), but unfortunately there are still moments when potentially great stunts are wasted because the viewer isn’t oriented, and gets no sense of how they relate to the space around them. This is the result primarily of editing, however. Gilroy is remarkably restrained and for the most part doesn’t attempt to ape Greengrass’s patented shaky-cam photography, only his rapid-fire editing. At the end of the day, The Bourne Legacy is an effective enough action movie that delivers in some crucial areas (Renner and Weisz are fantastic, the Manila locations are impressive, and the scenes of pasty bureaucrats and analysts yelling at each other about shutting down programs and tracking rogue agents carry enough urgency to propel the story even if you have no idea what’s actually going on), but fails in others. The Flowers for Algernon angle was an interesting idea, but didn’t ultimately work for me as the engine driving an espionage thriller. It also raises more questions than it answers. I can buy that Cross will cross oceans and battle enemy agents to keep his IQ from dropping back down to sub-normal levels, but I’m not sure why the government decided to use this medicine on a dummy to begin with. Wouldn’t it have made more sense to start with a fairly intelligent individual (or a bona fide genius, like Marta), and then jolt their IQ into the stratosphere instead of spending billions of taxpayer dollars making a somewhat challenged individual smart enough to calculate exit strategies? Ultimately, Cross’s quest to maintain his intelligence pales in comparison to Bourne’s search for his true identity. The movie also fails in tying fully into what’s come before. 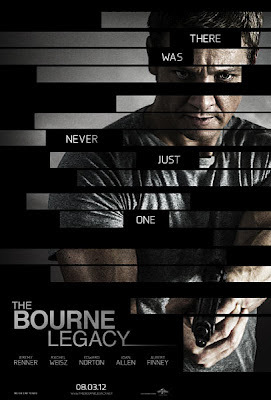 Sure, a host of familiar faces from the earlier films (Albert Finney, David Straithairn, Joan Allen, Scott Glenn) are paraded briefly across the screen to do just that, but the actual connection is too flimsy to merit the Bourne Legacy title. In terms of ties to Bourne himself, I liked the subtler ones, such as when the camera nonchalantly moves past the name “Jason Bourne” carved in the bunk Cross is sleeping in on his training course, but not the overly obvious ones like when it then jerks back and focuses on that carving as the music kicks in big-time. I also felt like the Moby song “Extreme Ways (Bourne’s Theme)” was out of place when it kicked in at the end of this film. As the title says, that’s Bourne’s theme (even if this remix is cleverly subtitled "Bourne's Legacy"); shouldn’t Aaron Cross have his own? Besides that, however, the music is good. James Newton-Howard does a fine job providing bombastic action cues that feel of a piece with John Powell’s signature scores for the previous movies, yet different enough to set this one apart. Ultimately, I think The Bourne Legacy is let down by the “Bourne” in its title—or perhaps it lets down that brand. It’s a fine action film in its own right with a compelling lead and some memorable moments, but it doesn’t live up to the thrilling brilliance of The Bourne Ultimatum. That said, I would welcome another installment that managed to team up Damon and Renner. As you say, a decent actioner. But IMO not really that distinguishable from any other film of the type these days. The only thing I enjoyed about the film was Renner's and Weisz's performances. Gilroy and Marc Forster (I'm glad you mentioned QOS) do not know how to direct an action scene, but instead rely on fast editing, which results in scene confusion. I like the Bourne films, but like I've said before, they just keep making the same film over and over and now adding this one to the list. With Legacy, just substitute the amnesia with the "chems" and Edward Norton for Joan Allen. Hello, Tanner. Longtime reader, first-time commenter. I enjoyed reading your review, especially since it became clearer as I read on that I had enjoyed the film a good deal more than your review indicates that you did. I say that as someone who has been something of a Bourne skeptic since the beginning; I found Identity disappointing (because it tossed out so much of what made the novel a spy-fiction classic), Supremacy an effective sequel to Identity but still lacking the novels’ larger-than-life scope, and Ultimatum one of the most loathsome movies I’ve seen in the past decade, an amoral video game with a colorless cipher at the center. Indeed, I felt so burned by Ultimatum that I was going to skip Legacy altogether until some early reviews raised the possibility of good things. You make some interesting points, though, particularly about why a simpleton like Aaron Cross was chosen for Outcome, and why the government would be so ruthless in shutting down a program they had spent billions to build, simply because of Jason Bourne’s antics. I think some of these issues can be justified, although Blogger wouldn’t accept my original comment (too many characters), so if you’re interested, I’d like to discuss them with you. I did like the movie a lot. I’m tempted to call it “The Bourne Redemption” because it redeems a lot of what I felt went wrong in the previous films, and I hope what they did right is carried forth in future films with Jeremy Renner and Rachel Weisz. I seem to be in the minority here. Bob, you've got a good poing about basically making the same film again and again, but I think the key difference is the changing locations--something that always accounts for a big portion of my enjoyment of most spy movies. Supremacy didn't really vary the European settings from Identity too much, but Ultimatum added Tangier (which played host to a great chase), and I did appreciate Legacy's use of Manila as well as the two stars' performances. Simes, I kind of agree about closing the book on the Bourne franchise... for the time being. What I'd love to see happen (fantasizing here; it never will) is for the franchise to go dormant long enough to warrant a reboot, and then to start up again as a 1980s period piece that actually follows the events of the novels, focusing on the hunt for Carlos the Jackal. You could even stretch each novel into two movies in faithful adaptations if you wanted to guarantee the reborn franchis longevity without resorting to crafting original stories like this one! Welcome, Quiller! It's always nice to hear from a new commentor! I'm sorry Blogger erased your longer post; that's really frustrating. I recommend always copying the contents of your comment before you try to post just in case something like that happens so you can paste it back and not lose the comment. Anyway, feel free to post your thoughts here again in multiple comments, or email me directly through the link in my profile. I'd love to hear your thought--but I'm sure everyone else would, too, so you might as well post them here! I'm glad you liked the movie more than I did. I felt the same way as you about Identity. On my first viewing, I was just so mad that it deviated so far from one of my favorite spy novels ever! I still don't understand why they had to jettison Ludlum's far more interesting plot (an amnesiac discovering first that he was an assassin, then that he was actually a spy pretending to be an assassin to catch another assassin is intrinsicly more interesting than an amnesiac merely discovering he was an assassin, and then deciding not to be), but I've come to appreciate it more over the years. With Supremacy, I was prepared from the first film not to expect anything from the Ludlum novel, so I was able to appreciate it more, though I still think that film has problems. We definitely disagree on Ultimatum, though, which is by far my favorite of the movies even though it bears no resemblence to the novel whose name it shares! (Though it does slightly return to the end of the original Identity novel with the New York part.) Follow the link to read my review of Ultimatum to learn why I liked it so much. Anyway, nice to hear from you! Please drop by again. Quiller, thanks for your memorandum. (Sorry about that.) While we disagree sometimes on this blog, we all respect each others' opinions and welcome them. I take it you might be an Adam Hall fan? Thank you for your responses, and for the warm welcome. Bob, I am indeed an Adam Hall fan. Still sort of haphazardly working my way through the series; my favorites so far include The Quiller Memorandum, Quiller KGB, Quiller Solitaire, and just plain Quiller (published in the UK as Northlight). Tanner, thanks very much for your comments. I haven't seen Ultimatum since its original release five years ago, so now might be a good time to revisit it. I think your point about the movie Bourne vs. the literary Bourne is well taken. Obviously, a movie version of Identity released in the 2000s couldn't possibly involve Carlos, since he's been imprisoned in France since 1994. But it would have been child's play to invent a new "superterrorist" and make him the target of Bourne's manhunt. As a friend of mine pointed out while Identity was still in production, over time, Carlos became the personification of David Webb's dark side, the literal manifestation of everything he hated about being Jason Bourne. Without Carlos, as my friend put it, there was no story. The use of the real-life Carlos also gave the story that larger-than-life, world-shaking quality that I so loved about Ludlum; he found ingenious ways to tie his labyrinthine conspiracies into current events and real-world threats. The movies seem to take place in a sort of closed-off world in which the only inhabitants are Bourne and the evil CIA; there's no sense of the larger world around them. 1) Your comparison of Cross's situation to "Flowers for Algernon" caused a light bulb to go on in my head. I didn't interpret it this way when I saw the film, and I don't know why. I think it's because I was focusing on the physical consequences of Cross's Outcome enhancement, rather than the mental and intellectual effects. Certainly I remember the scene in which Cross talks mournfully about how his Army recruiter had to increase his IQ on paper in order to get him accepted, but I figured, maybe a point or two, nothing serious. Now that you've put it in that context, the whole film plays differently in my memory. I was going to buy it on Blu-ray anyway, but now I might go back and see it again in theaters, to see how it plays for me. 2) Regarding why Cross with his sub-par IQ was chosen for Outcome: my notion is that he was chosen because the Outcome architects felt his inferior intellect combined with the drug regimen might make him easier to control. It's true that giving the training and chems to an average or above-average intellect (or, as you pointed out, a super-genius like Marta) would have launched his/her abilities off the charts, but such people would come with their own ideas, their own opinions, their own consciences -- and might plausibly end up like Jason Bourne, rebelling against their training. If we assume that Outcome is the evolutionary next step after Treadstone, we can infer that whoever was in charge was aware of the problems that the Treadstone managers had with Bourne, and sought to avoid him. Since nothing in the previous films suggests otherwise, I have to assume that David Webb was functioning with average to above-average intelligence when he joined Treadstone. 3) So why, then, having spent billions of dollars to train and program Cross and the other Outcome agents, would Rick Byer and his cohorts go to such extreme ways (sorry, I had to) to "burn the program to the ground?" I think the answer has to do with the LARX program which comes into play as the film approaches its climax. The way I see it, Treadstone was level 1, Outcome was level 2, and LARX is level 3. Treadstone is blown sky-high as a result of the actions of Bourne and Pamela Landy. Outcome is at risk of being discovered as a result -- and if Outcome is discovered, LARX is next. But if Byer and company erase every trace of Outcome's existence, including killing off all of the agents and all of the scientists working in the back office, Congress and the press will find nothing but dead ends, and conclude that Treadstone was the end of the line. Thus, LARX stays protected and functioning. I agree that, considering the conversation between Byer and the general about Outcome's successes in Iran and Pakistan, it doesn't make a lot of sense for the government to so brutally shut down an accomplished intelligence operation like this. But what if Byer thinks that LARX can do the same sort of jobs, perhaps even more effectively? Then it makes sense to protect LARX at all costs, by sacrificing Outcome (and with Treadstone already gone). If I'm right about any of this, the fault is Gilroy's; he should have made it clearer, or at least alluded to it, in the text of the film. Art movies can play all the games they want, but a big-budget, mainstream entertainment has different rules. 4) On the use of "Extreme Ways:" really, I can't imagine a Bourne movie that doesn't end with some version of "Extreme Ways". I guess it's because I don't see it as a personal theme for Jason Bourne himself, but more a theme for the entire world that the movies have created. Still, it's quite fair to say that Aaron Cross deserves his own theme song. I totally agree with your fried about Identity, Quiller! It's true: without Carlos, you really do have no story. What you're left with is a new man condemning his old self, which isn't even quite what they seemed to WANT it to be, which was an assassin having a crisis of conscience and rejecting his chosen path. Bourne in that movie doesn't really reject anything because he doesn't even remember that life fully. He essentially passes judgement on SOMEONE ELSE'S life, which is just sanctimonious. That major gripe aside, I have, as I said, come to appreciate that first movie for other reasons: Liman's direction, the Mini chase, the embassy fight, Franka Potente, and a guy smashing through a window firing a machine gun. I remember thinking at the time that it had been far too long (in the era of Matrixified bullet-time) since we saw an actual guy smash through an actual window firing a machine gun. All of your explanations for my plot questions about Legacy make sense. Though I'm not at all sure from what we see of LARX that a LARX agent COULD penetrate the ISS or any other organization! By taking away their emotional reactions (or whatever they did), they seemed to turn that one guy into so much of a robot that he'd stand out just about anywhere, rendering him totally useless for deep cover penetrations! "Why does the new guy always walk with such single-minded purpose? You noticed that about him?" "Yeah. And what's with the sunglasses? Oh crap, he's looking at us!" Let's hope the franchise gets another chance to do better (hey, they were lots of bad Bonds). There was very little in the way of plot. They try to kill Renner. They try to kill Weisz. 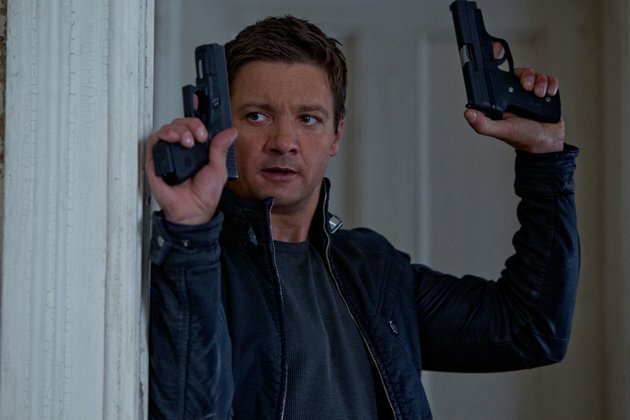 Renner saves Weisz. They fly to Manila, go to the lab, escape, are pursued by the agent and, silliest of all, wind up on a boat to nowhere. That was it. It was a movie made by an Etch-A-Sketch. Renner was fine and has a Daniel Craig style about him. The lack of plot and detail made it drag and the endless shots of the surveillance rooms the series has become known for has worn out its welcome. I wanted to like it but didn't.